Panasonic’s new PT-RZ21K 20,000 lumens 3-Chip DLP™ SOLID SHINE laser projector provides built-in redundancy and extended operation, making it perfect for large university lecture rooms in constant use and staging/rental industries where the ‘show must go on’. Set to be released in Australia in December, the PT-RZ21K is designed for tertiary, rental, live entertainment, staging and any permanent fixed large venue and offers 20,000 hours maintenance-free operation. The projector is engineered to withstand continuous 24/7 operation, and because it is laser technology, without the need for lamp replacement, there is less picture degradation over time. These capabilities add up to a lower total cost of ownership for rental operators and other organisations. The new projector presents a laser alternative to the current PT-DZ21K, which is the current industry workhorse in the rental and staging market with an increasing market share worldwide in this space. It also joins Panasonic’s growing range of laser projectors, from the PT-RZ470 Series to the PT-RZ31 series, which are growing in popularity with universities in both Australia and internationally. All of Panasonic’s existing PT-DZ21K 3-Chip DLP™ lenses and frames will work with the PT-RZ21K, helping maximise the investment that rental companies have made in Panasonic. 20,000 lm of SOLID SHINE laser power in a compact, lightweight projector that cuts total cost of ownership. 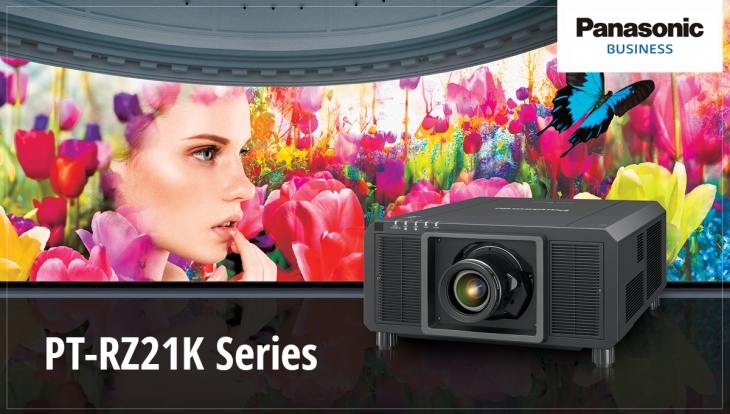 The PT-RZ21K Series will be available in December 2017 from specialist Panasonic projector distributors and resellers.